More conservation organizations are seeing the need to involve local communities in monitoring wildlife and other conservation activities for informed decision making, thanks to advances in technology in data collection, storage, retrieve, analysis and information disseminations. Wildlife numbers and distribution, poaching, bush meat, encroachments, human-wildlife conflicts are some of the parameters being collected by Village Game Scouts (VGS) and Village Natural Resource Committee (VNRC) among others and appear too complex especially with the semi-illiterate scouts but have been simplified. With the increasing footprint of human activities and complex conservation efforts, many parameters have emerged that needs to be monitor in order to effectively deal with the threats and challenges, hence, the way of data collection needs to be modified. However, until recently not a great deal of effort had been spent on assessing the impact of human activities on the wildlife and forests. Equally, the existing hard data has not been analyzed for use to establish the impact of human activities on conservation efforts. In 2009, the use of MOMS, a system of data collection by community conservancies that originated from Namibia was introduced to the Wildlife Management Areas in Tanzania. Comprising of the yellow and green books, the information is manually written. This has been cumbersome, lots of mistakes especially on GPS readings, double work due to transfer of the same data to another booklet, difficult to use under wet condition, possibility of loss of data in case of loss of the books or fire among other challenges. Most of the data has not been input into the computers for analysis and hence difficult to analyse and to influence informed decision making. Besides, it has been costly and time consuming for WWF and Community Wildlife Management Areas (CWMA) to make monthly visits to WMAs and consolidate data from the booklets. Now with the emerging technology, WWF in consultation with CWMA decided to change all this and embrace the use of smart phones in data collection. Simple applications called Miombo and Open Data Kit (ODK) were designed where data collected is directly relayed to WWF/CWMC Cloud/Online System. That way data is permanently secured and inference can be made from the long term monitoring to see the impact of human development on conservation efforts and also for policy formulation. WWF which has been working in the Ruvuma Landscape for many years do not have most of the data due to the way it was collected by several different people. According to Dr Noah Sitati, a Wildlife Species Expert with WWF TCO, ‘it has been difficult to really measure the impact of the interventions by WWF in the programmes because of inconsistencies and gaps’. ‘What this brand of monitors aims to do is to record all variables that will inform holistic and integrated approaches to conservation efforts using available data and really value for donor money’. Sitati says. 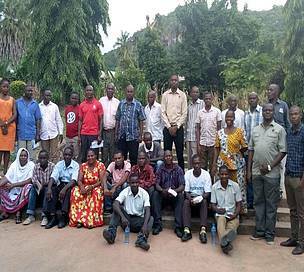 Miombo & OpenDataKit(ODK) Apps with its online data repository with fifteen (15) data forms to be collected in seven WMAs and nine Village Land Forest Reserves (VLFR) spread in 4 districts namely Rufiji, Liwale, Tunduru and Namtumbo. A total of 73 VGS, VNRCs, Authorized Association (AA) leaders, District Game Officers and District Forest Officers as well as WWF field staff were trained on how to use smart phones to collect patrol data. The 23 distributed smartphones will help to manage, share, protect and analyze their data as well as preserve it for posterity while deserminate the analyzed data (informations). “Miombo and OpenDataKit(ODK) Apps doesn’t do conservation, but will enable conservation to happen,” says Mathew Langen, a GIS Specialist at WWF Tanzania, a developer of Miombo App. The smart phones which have an internal GPS, camera/video and compass will enable animal tracking data collected every day including the longitude/latitude position and images/pictures, to be able to match to the corresponding value on the human footprint in the landscape to see how humans impacted on wildlife and forest conservation. From the data, it is easy to tell if the scouts are doing patrols or not since the GPS will show places visited and the man hours involved during patrols with pictures as evidence. “Seeing the data in this way has an unexpected effect,” says Noah Sitati. During the training, we have found that the scouts who use the apps are highly motivated become extremely interested to undertake patrols. Through rapid analysis of the data, patrols are properly coordinated to focus in specific areas of concern hence achieving greater impact. They get a deeper insight into areas with high human-wildlife conflict incidences, encroachments, poaching, etc and are able to allocate resources appropriately for intervention. The purpose is to provide an updated map of hot spot wildlife threats and the impact of people on forests and wildlife habitats in specific locations, which is essential for wildlife planning and management. “I think our biggest contribution so far is to make the life of scouts in the field easy. It also gives a second life to improved ways of data collection – and that can happen over and over again with emerging new technologies, ” according to Sitati. There have been challenges too. Poor mobile phone network connectivity for communication is some parts of the landscape is a problem. Scouts have to locate areas with strong connectivity to relay the data. Sustaining power for smart phones in remote areas without grid power is a challenge and extra power banks needs to be procured as well as solar systems for charging the phones. Some of the WMAs are yet to start generating revenue to help support basic costs of using the application such as data bundles. “Miombo & OpenDataKit(ODK) Apps are vital. It is important that information can be shared quickly and saved for posterity so that people can analyze it again in 5, 10 or even 50 years in the future. WWF Tanzania is using a similar Apps to collect data in Marine Programmes. All WWF programmes should embrace the use of technology in data collection”.